As parents, we are forever proud of our children's achievements. How big or small doesn't matter. Our hearts swell with pride each time our kids do good because that just means we did good as parents too. All that is normal, but when an outsider recognizes our child's accomplishments too, then that feeling is extraordinary. You could expect rewards and compliments from a grandparent, an aunt, a friend but never from a restaurant, right? 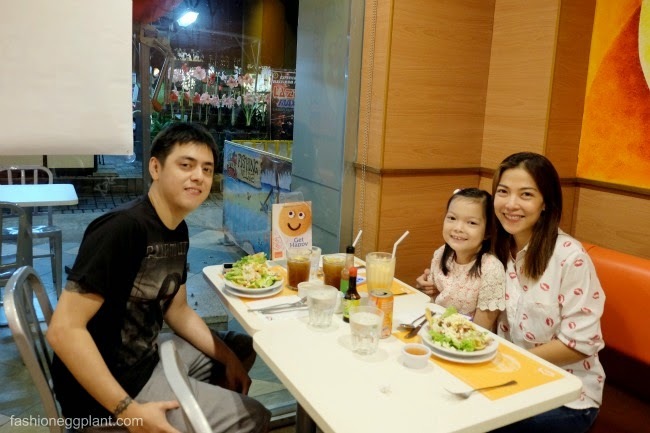 Pancake House is probably (already) the most well-loved, family oriented restaurant in the Metro but with their "Get Happy" promo, you will love them even more. 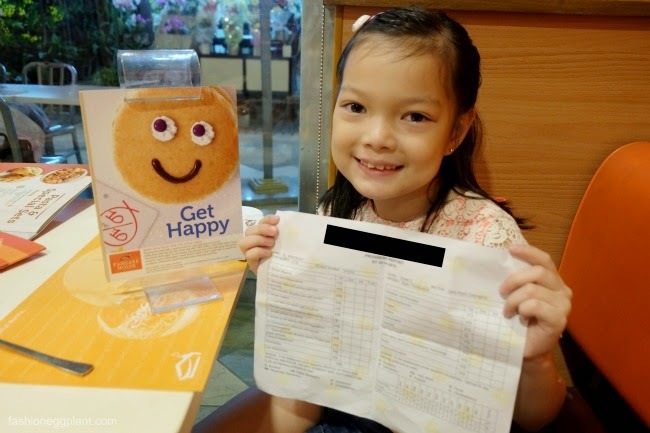 Get Happy acknowledges our little one's achievements and rewards them with a "smiling" order of triple stack "Small Soldiers" pancakes for good grades. Yup, that's right, no strings attached and totally free. We decided to pay a visit to our neighborhood Pancake House branch for an early dinner last Saturday and give it a try. We kept it as a surprise from Nikola because I wanted to see her reaction. After dinner, I asked Dennis to hand over Nikola's most recent report card so I could present it to the waitress and avail of the Get Happy promo. And that was when the waitress congratulated her for her good grades and told her she was getting a reward. She couldn't believe it and I could see in her eyes how proud she was of being able to help her mom and dad "get free food" by having good grades (She thought her good grades shouldered the entire bill - haha). Kidding aside, from experience, Get Happy isn't just about rewarding your little ones with a dish they love, it also teaches them a valuable life lesson - hard work reaps benefits. And it truly gives them a sense of self-achievement and satisfaction. 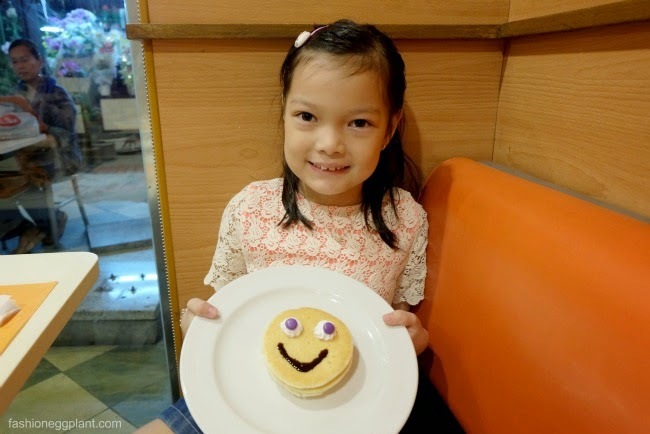 Take your kids to the nearest Pancake House and try Get Happy today. Just present any of the following with a school emblem: quiz or test paper, work sheet, report cards, certificate or awards for academic, behavioral, sports and other extra curricular activities. 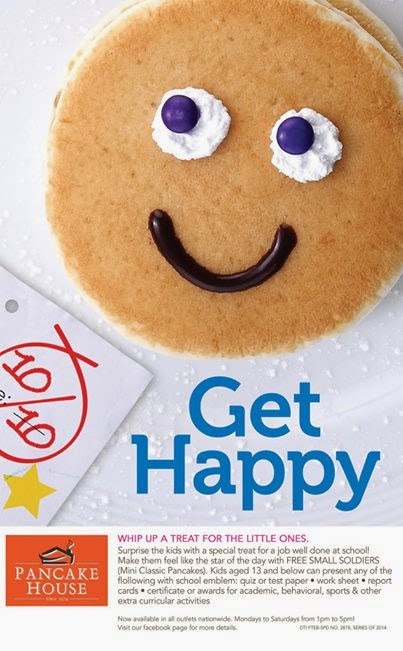 Get Happy is available in all Pancake House outlets nationwide from Mondays to Saturdays from 1pm to 5pm.